Do you own a New York City/State building that has a cooling tower as part of your HVAC system? If so, you’ve certainly heard about the new cooling tower regulations recently passed by the city and the state following last summer’s outbreak of Legionnaires’ Disease. How does this legislation affect you, and what do you need to do to be in compliance? Many of our customers have been asking us for clarification and advice, so we’re betting you have questions. Here are some answers from Gary Berkowitz, Arista’s Manager of Chemical Cleanings and an expert in cooling tower maintenance and the new cooling tower regulations. Do I have to register to comply with cooling tower regulations, and how do I do so? Any owner of a building with an existing cooling tower must register the tower with the State Department of Health and the New York City Department of Health and Mental Hygiene. All new cooling towers must be registered prior to initial operation. There is no cost to register a cooling tower with the State or City at this time. The registration of the cooling tower is mandatory and failure to do so will result in a fine. Click the link below for the New York State website to register your cooling tower. Besides registration, what do the new cooling tower regulations require? Any owner of a building with a cooling tower must obtain and implement a maintenance program and an ASHRAE 188 Water Safety Plan which must be in effect by March 1st, 2016. Maintenance program. To comply with cooling tower regulations, a cooling tower with 12 month operation will require two cleaning and disinfections per year. Your maintenance program must also include legionella testing, chemical metering equipment, and bacteria testing. The cooling tower and associated equipment must be inspected for the presence of organic material, biofilm, algae, and other visible contaminants. Quarterly Legionella testing is required and must be performed at a certified laboratory (for health care facilities or other high risk as determined by the plan). You might want to substitute at least quarterly HPC testing for non-healthcare, low-risk towers. The overall conditions of the sump basin, eliminators, fill material, water make up connections and controls must be inspected. Proper functioning of the conductivity controller and chemical metering equipment including solenoid bleed must be part of the overall inspection. Chemical metering and water treatment. All cooling tower end users will require the services of a water treatment company and proper chemical monitoring and metering equipment. Culture Sample Testing & Tower Disinfection. Any owner of a building with a cooling tower must collect samples and obtain culture testing every 90 days, or in accordance with a maintenance program and plan obtained by the building owner. Immediate disinfection is required if culture sample testing demonstrates a need. ASHRAE 188 Water Safety Plan. The plan must include a schedule for routine sampling, as well as procedures for emergency testing and disinfection to destroy Legionella bacteria. Owners must maintain a copy of the plan on the premises where a cooling tower is located, and make it available immediately upon request. Want to learn more about how to put together your ASHRAE Water Safety Plan without wading through the entire standard? 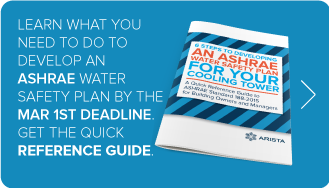 Get this FREE quick reference guide that explains the basics: 6 Steps to Developing an ASHRAE Water Safety Plan for Your Cooling Tower. Compliance reporting. In addition to registration of cooling towers, all actions required by the new cooling tower regulations must be reported to the electronic system, within 10 days of such actions being taken. Reports must be generated every three months by the water treatment company and in some cases a Consultant who will supervise the water treatment company to insure compliance. This report must be added to the New York City Department of Health website where you are registered. What’s the timeline for compliance with the cooling tower regulations? Your maintenance program and ASHRAE 188 Water Safety Plan must be in effect by March 1st, 2016. All cooling towers must be inspected every 90 days. All cooling towers must be certified as complying with all regulatory requirements (both New York’s new cooling tower regulations and ASHRAE Standard 188) by November 1, 2016, and thereafter annually by November 1 of each year. This includes all required responses to bacteria results and all required reporting to Authorities Having Jurisdiction. The New York City Department of Health will be sending inspectors to make sure you are in compliance with the new cooling tower regulations. An officer, employee or agent of the Department of Health may enter onto any property to inspect the cooling tower for compliance with the requirements of the cooling tower regulations. If an owner does not properly register, certify, inspect, clean or disinfect their cooling tower the Department of Health may determine that such condition constitutes a nuisance and may take such action as authorized by law. UPDATE: NYC has passed Local Law 77 – 2015 for the control of Legionella in building water systems. As of this time they have proposed rules for the implementation of Local Law 77 but following a public comment and review period they are yet to be finalized. When completed they will be at least as rigorous as those outlined here. previous post Retail HVAC: How Clothing Almost Destroyed a Brand New HVAC System next post The Rooftop Air Conditioner: How Does It Work for NYC Spaces?